Wandering up and down the narrow alleys or gazing over the medieval walls to the countryside below, you'll be enveloped by the centuries of history in Assisi. The hilltop city in central Italy's Umbria region is best known as the birthplace of St. Francis, the country's patron saint and founder of the Franciscan order. 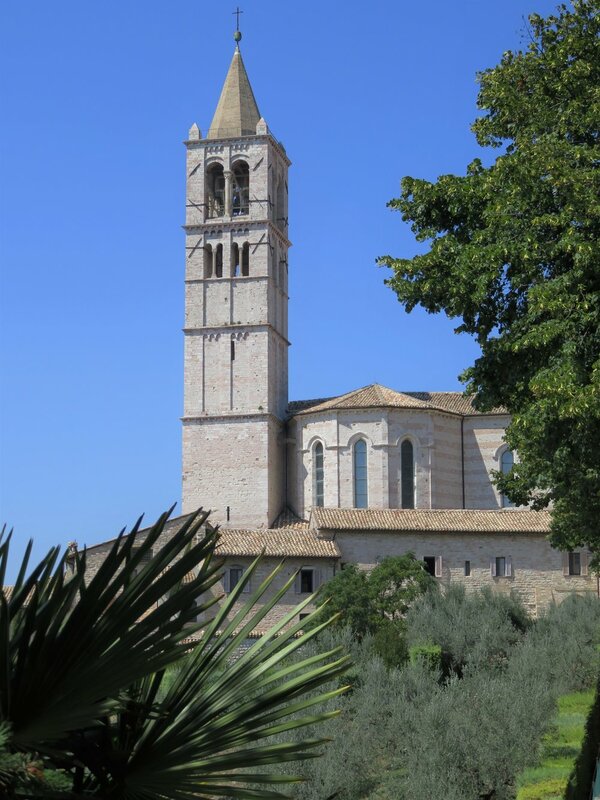 Assisi and its landmark Basilica of San Francesco collectively make up a UNESCO World Heritage Site. Keep scrolling to see the beautiful churches and streets of this old Roman town. There's nothing better than driving through the Italian countryside, hopping from hilltop city to hilltop city. Notice all the different shades? The region of Umbria is known as the Green Heart of Italy. Assisi sits about 1,300-feet high on a ridge of Mount Subasio in the Apennine range, overlooking two river valleys below. Beyond the city's medieval walls, you'll see rolling hills covered in a patchwork of greens and browns. Though less than 30,000 people live in Assisi, the city sees plenty of tourists, due to its convenient location about midway between Rome and Florence. Because of its ties to St. Francis, it also is a pilgrimage site and shrine for many Roman Catholics. Basilica di Santa Chiara is a 13th-century church dedicated to St. Clare, founder of the Poor Clares and a protege of St. Francis. She is credited with saving Assisi from attackers twice, among other miracles. In a strange twist, she was named the patron of television in the 1950s by Pope Pius XII because she supposedly witnessed the Christmas mass of 1252 at the basilica of St. Francis from her sick bed on the other side of town. She died the following year, and her preserved body is on display in a crypt beneath her namesake church. The Temple of Minerva was constructed sometime in the first century and named for the Roman goddess equivalent of Greek goddess Athena. In its long life, the building has been used by Benedictine monks, as headquarters for the Commune of Assisi's in its early days, and as a jail. Restored during the Renaissance, and again with an Baroque interior in the 17th century, the structure's original roots remain only in the exterior facade and perfectly preserved Corinthian columns. It's now a Roman Catholic church bearing the name Santa Maria sopra Minerva, translated "St. Mary over Minerva." Built between 1228 and 1253 the Basilica of San Francesco (or St. Francis) holds a stunning array of early Renaissance frescoes from artists like Giotto di Bondone and Giovanni Cimabue. The basilica consists of two floors, a lower church with the crypt of St. Francis, and an upper church, with paintings depicting his life and scenes from the Bible. Born in Assisi in the 12th cenury, St. Francis's ministry revolved around a life of poverty and charity, and it is said he referred to all types of living things as his brothers and sisters. A number of affordable hotels in the middle of town make it convenient to walk to all the attractions or grab a cappuccino in the mornings. For the best views of the city, though, check out Grand Hotel Assisi, a quiet, hilltop property just outside of town where you can watch the sun set over the valley. Assisi makes for a great day-trip destination from both Rome and Florence, but I wouldn't hesitate to recommend it for a longer, relaxing retreat too. It can get a little crowded with tourists in town, especially in summer, but move a few steps away and you'll find yourself surrounded by a gorgeous green landscape and incredible views.